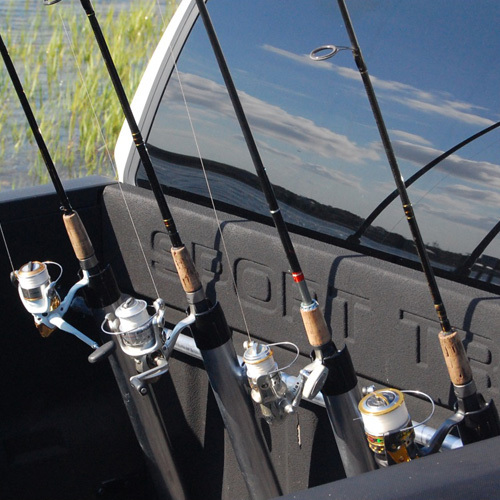 Portarod Fishing Rod Racks, Fish Pole Carriers and Accessories for Pickup Truck Beds are the perfect products for fishermen that don't want to lay their fishing rods in the bed of their truck or constantly assemble and disassemble their rig. Portarod's ratcheting design is easy to install and adjusts to just the right angle. The vertical angle and the space between each rod holder can be easily adjusted to meet your exact needs. Portarod's strong, noncorrosive, aluminum construction is built to withstand the elements. The compact design can be easily transferred from your truck to the garage - which allows for versatile garage storage options. The Portarod INSHORE system is a stylish, light weight, fully adjustable, easy to use, easy to store rod holder that expands from 53" to 84". The Portarod OFFSHORE Rod Holder can handle anything from your smallest inshore rods to your large offshore gear. Portarod OFFSHORE has a sturdy 1.476" ratcheting support bar that expands from 63" to 89" and fits almost any full-size or super-duty truck bed. The GearRak Ultimate Rod Transportation System provides a convenient, safe and secure method of transporting your fishing rods and reels on your existing car, truck, van or SUV roof rack. The GearRak is easy to use, durable, weather resistant and engineered to withstand the potentially harsh conditions of your adventure. The GearRak Rod Transportation System is equipped with a molded locking mechanism for enhanced security. GearRak's adjustable crossbar clamps fit the crossbars of most factory and aftermarket roof racks.